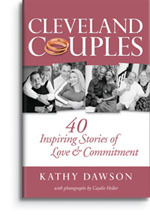 The stories of these 6 and 34 more Cleveland couples are the topic of this new book by Kathy Dawson. Some, like those listed above, will be familiar names. Others may not be. Each of the 40 stories offers something unique - a romantic tale or a joined battle against a tragedy and illness or success the second time around. Different ages, races and situations are covered in these vignettes; each covering 3 or 4 pages. Each includes a black and white photo of the couple taken specifically for this project by Caydie Heller. Author Kathy Dawson is a local marriage/relationship expert and weekly columnist for the Plain Dealer. She founded the Marriage Movement and speaks and writes about marriage. The book is like a Valentine's Day chocolate sampler. You can open it, browse the selections and choose one or two to sample - until the craving strikes again. Copyright � 2007 ClevelandWomen.Com. All Rights Reserved.